Our region's newsletter, Steinlifters, has evolved since the region was formed in 1960. Now, we mark another evolution in the newsletter's history as Steinlifters Online debuts. While the printed and mailed version of your region newsletter takes its honored place in our history, you can still count on getting up-to-date information about region-hosted events and other interesting news associated with the cars we love to drive via our Web site. Every month, a page like this will be compiled to capture important information. A link to remind you that a new online newsletter page has been added will be sent via e-mail. We will continue to welcome articles written by members about their experiences in purchasing, owning and driving their Porsche. Speaking of members, I invite any member who is interested to tell us their story about themselves and their car. For years we have been including profiles of new members as a way to welcome them and introduce them to the current membership. In we welcomed six new members as well as members who have transferred from other regions. We'd also like to report on current members. 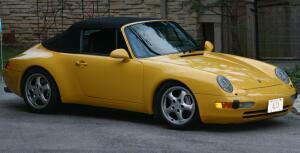 Everyone has an interesting story about how they acquired their first Porsche. Maybe you've owned more than one. Tell us. Send your story with a .jpg photo attached to the editor. Congratulations to these members who are observing an anniversary in August. Aug. 7 - Board meeting. All members always welcome to attend these meetings to provide input on what you like and what you'd like to see more of in terms of club activities. Aug. 10 - Autocross at the Rockford Speedway. Event held in conjunction with Central Wisconsin and Chicago Regions. Central Wisconsin is hosting this event. Earn points in this three-region competition. Visit the Autocross Events page for all details. Aug. 10 - Complimentary parade laps at Road America for Porsche drivers. Read about a special offer from Road America to drive the track during the American LeMans Series weekend. 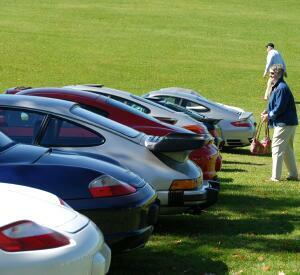 When you're visiting Road America, remember to park in Porsche Park, the designated parking area for Porsches. Milwaukee Region has proudly maintained Porsche Park for many years so that Porsche drivers everywhere can park their cars in good company. Aug. 16 - 17 -- Drivers Education (DE) at Blackhawk. Milwaukee Region is pleased to offer a weekend of DE. Novices and experienced drivers alike will enjoy the opportunity to get in some quality track time. Never did DE and want to know what it is like? Take advantage of the Taste of the Track program. For $35 you can learn how the event is structured, go out with a trained instructor who will drive your car on the track to show you how to navigate the turns and corners and find "the line" and more. Check it out. Want to sign up to drive DE this time? If you are new to the club within the past 12 months, take advantage of the special discounted entry fees. DE contacts and all information is available on the DE Events page of this Web site. Aug. 23 - Masterpiece Concours at Milwaukee's lakefront. If you love to keep your car extraordinarily clean, this is the event for you. If you are not into such detailing, then come out as a spectator to see an assortment of well-maintained cars. Aug. 30 - Concours in Elkhart Lake. Chicago Region invites Milwaukee members to participate in an interesting concours in a unique setting. 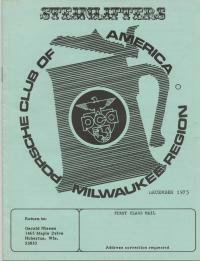 Aug. 31 -- Autocross at Miller Park. The Milwaukee Region is hosting its second autocross of the season in the east parking lot of Miller Park. Autocross is a low-speed event on a controlled course. You do not need to transform your car into a "track" car to enjoy Autocross. Many drivers compete with their car equipped as it came from the factory. Helmets are required. For full details, visit the Autocross events page. The annual fall tour is set for Sept. 13. Join other region members and friends as we explore some of Wisconsin's finest roads. The Sept. 13 tour features a new format -- a half-day tour. Many members said that other commitments made it hard for them to join a full-day tour. Lee Heppe, our legendary tour chair, listened to those comments and is putting together a half-day tour that ends with lunch. A highlight of this tour will be a stop to see the 88-turbine wind farm that We Energies has established in Fond du Lac and Calumet counties. Sept. 14 - Autocross at Miller Park. The last in the series of autocross events sponsored by the Milwaukee Region this season. Details on the Autocross Events page. This time last month, several members of the Miilwaukee Region were wrapping up their participation in Parade 2008 at Charlotte. There's nothing quite like being in a defined space with nearly 1,000 other Porsches and nearly 2,000 members of the Porsche Club of America. The region was well represented in several of the competitive activities at the Parade. Geoff Wilde's photography entry won a ribbon in the Art Show, Ned and Jeanne Boston trophied in the TSD rally and Mike and Bev Jurkowski were among the top finishers in the gimmick rally. Think about making the Parade in Keystone, Colo., next summer your vacation destination. Porsche Cars North America reports that July sales overall are down from a year ago but Boxster sales are booming. Read the PCNA sales report here. Porsche also announced details of the 2009 Targa and Targa 4S. Read about it here. I'm putting one of these on my wish list. 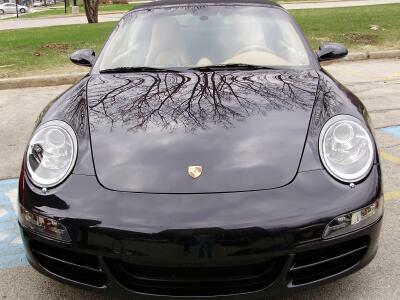 This is the place to look for your next Porsche or sell one or a related item. Members report excellent results when using our classifieds. Did you know that each time you refresh the home page of this site the photos in the upper right corner of the page change randomly. Photos currently in the mix include some members cars as well as stock photos. I'd love to run more photos of members' cars than the stock stuff. Send the editor a .jpg. The Members only section of this site found in the Resources drop down is password protected. It contains the names of members, along with an e-mail address (if the member supplied that in their membership record with PCA). To access this section, send an e-mail to the webmaster with your name and membership number. The password will be sent to you. What other features would you like on this site? What other features would you like to see on this Web site? Tell the webmaster.